« How Thick Are Ye? It is not just a tree in a phone box. It is not just a futile attempt to avoid the responsibility of having to get rid of the last remains of Christmas, or some teenagers’ attempts at a funny “joke”. No, this is art in every sense of the word and I am making arrangements for this to be moved into the Laing Art Gallery as soon as possible. I find the peeling sticker at the top particularly poignant. 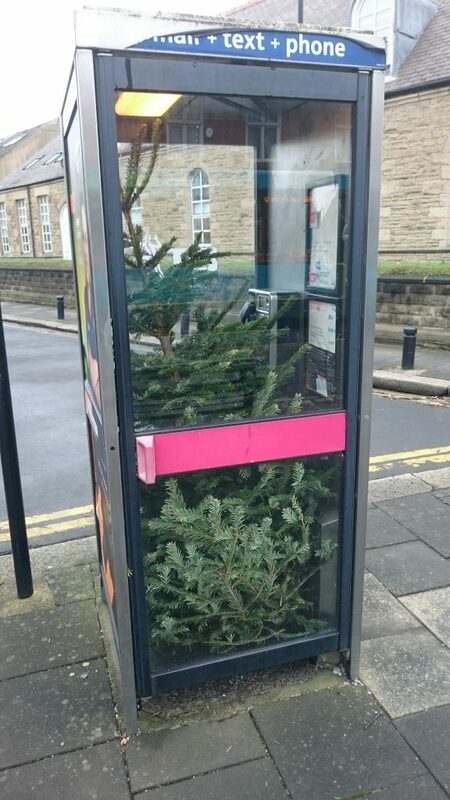 The abandoned christmas tree representing the fading desire to send email and text messages from a pissy phone box on the street corner. It works on so many levels the museum may need to install several mezzanine levels to allow the public to appreciate the sheer art of it all. It needs as many levels to appreciate this as I have spoilers. At least seven. Maybe more. It might just have been a homeless Christmas tree (let’s face it, it does happen people) looking for loose change. This is truly startling. Do we know which thrusting young artist produced this masterpiece? I’ll bet Nizzle hangs out with them, whoever it is. Thrusting young artist? That’s a bold statement, or a vole statement as my phone tried to write. Are you saying the artist is a vole? That WOULD be a vole statement. But I’d be willing to believe Nizzle hangs out with woodland mammals. That’s pretty 2017. By Christmas I expect we’ll all be doing that. Yes. That’s exactly what I’m saying. The artist had to get a swarm of his buddies to help with this particular piece. I wish I had seen it because that would be a work of art in itself. Voles are very fourth wall. I once split a case of rum with a badger. Voles are totally fourwide. Not like dormice. Those guys are lame. Dormice are so 6 wide its almost painful to think about them. Now field mice, those guys can jive. Why did nobody tell me sooner? I was just about to employ a small group of dormice as night watchmen and women. Night watch mice. You get the jist. I might get the jist (gist? ), but the joke’s on me because field mice get the jive. Is it the gist? I’ve never actually gotten the jist or the gist, so I wouldn’t be able to tell you. When someone gets one, can they let me know? I’ve got a warehouse full of gist, just outside Basildon, I’ve despatched a lorry load in your direction this morning. That one post is proof that the Beans is better with Kev around. I’d never have thought of that, and if I had, I’d have written it and it wouldn’t have surprised me and I wouldn’t have nearly spat coffee into my phone. It hasn’t arrived yet. Did it get stuck on the A198702Q? Everything is better when I’m around! The driver said he tried to deliver it last Thursday, but you didn’t answer the door. You should have had one of them little cards through your letter box to arrange re-delivery.